Bioflex is a flexible, and is safe even for initial piercings. It is very easy to take in and out and is great for those that have sensitivities to other metals and the best part of all: it's flexible! 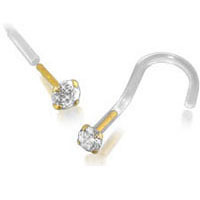 The top of the screw is 14K Solid gold, with claws holding a gorgeous 2.5mm CZ. So the bioplastic is not seen at all. It gives the impression that it is a complete solid gold screw but gives the compfort of Bioflex! !